With just twenty seconds to go, Hopkins scored the go ahead basket against Holyoke Catholic on a left-handed lay-up from Maddie Stevens. Stevens was left wide open, giving Nicole Morrison a clear path for the inbound pass. The Hawks were down seven points with just four minutes left on the clock, when Stevens hit a 3-pointer to provide her team with the momentum needed for the 38-36 upset win over the 3rd seeded Gaels. The next game time has yet to be announced, but the Hawks will be playing the semi-final game at The Cage for the first time since Hopkins’ last 1000 point scorer, Erica Hunter, led the Hawks there in 2006. Check out highlights of last night game from WGGB — Hopkins footage rolls about four minutes in. Basketball season is quickly approaching and you know what that means- nights full of good tunes, great games, hanging with your friends and trying to be more outrageous than the opposing team’s fans. One thing that we started doing last year was picking nights where we would all dress up for a certain theme, like Black Out Night or Beach Party Night. I think that we should keep it going this year, and this will be the place to get all your info on what you need to wear and what games you’ll need to wear it to. The first home game for the Varsity boys will be Thursday 12/16/10 and Varsity girls will be Tuesday 12/21/10. The theme for the season openers is still unknown, though there will be updates when we get closer to those dates. As for now, it’s just something to think about. If you have any ideas on what you think we should do, feel free to find me and give us your input. 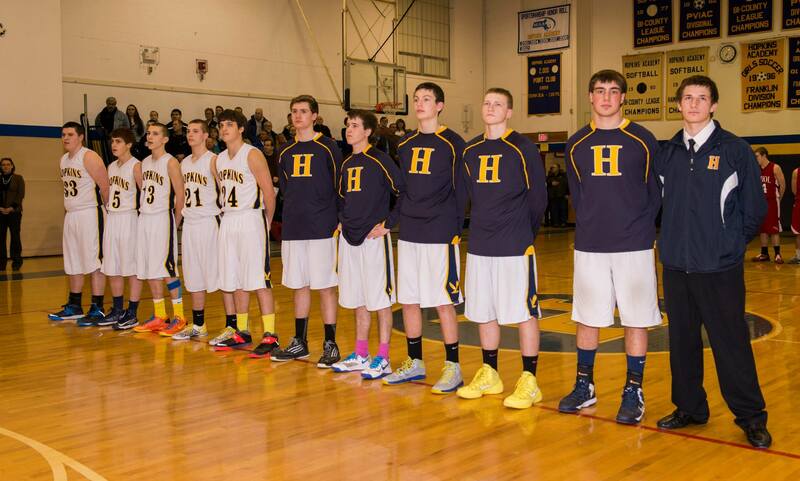 The boys first varsity home game is tonight against the Mahar Senators. Last season the Senators went 18-4 and our Golden Hawks went 9-11. This game will be a tough one for the Hawks, but who’s to say how this one will go? On another note, tonight will also be White Out Night, so wear a white shirt and, if you have them, white shorts. Tonight our Lady Hawks will be taking on the Athol Red Raiders. The J.V game will start at 6 and the Varsity at 7:30. Tonight will also be Flannel/Lumberjack Night. So break out your favorite flannel some cruddy jeans, suspenders, and a pair of boots.